With SHM.Blade® or IDD.Blade®, you increase the economic efficiency of your wind turbine. Due to the early detection of damage or icing, you can prevent the development of severe damage and thus minimize repair costs. At the same time, you reduce the downtimes of your turbine and thus increase the energy yield. Another advantage is the automatic restart of the turbine when the blades are ice-free: visual inspections by service personnel are no longer required and downtimes due to icing are reduced to a minimum. 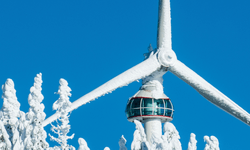 Moreover, the risk of ice shedding from rotating rotor blades is minimized and thus you protect people and structures near the wind turbine. SHM.Blade detects structural changes in relation to a certain reference condition. This reference condition is determined fully automatically without any help from outside and individually for every single rotor blade immediately after the activation of SHM.Blade. Such a blade-specific learning phase ensures high sensitivity to damage – despite the mass and stiffness tolerances caused during production. After completion of the learning phase, the system continuously calculates condition indicators, which provide information on the current condition of the blade at all times. By means of a two-level warning and alarm concept, the system control can react and subsequent damage can be prevented. In the field of Structural Health Monitoring (SHM) Wölfel relies on various measured physical parameters in order to be able to draw conclusions about structural changes from these multidimensional data. The decisive factor is a fully automatic online signal analysis directly in the wind farm. Damage must be reliably detected and distinguished from normal impacts from the environment and current operation.